Taenia solium (pork tapeworm) and T. saginata (beef tapeworm) produce ova that are indistinguishable. The ova are about 35 µm in diameter and have a striated edge. 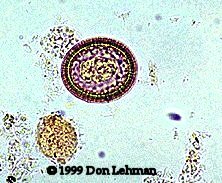 Humans develop these tapeworm infections by ingesting cysterceri in the muscle of infected animals. The scolex of T. solium (show here) has four suckers and an armed-rostellum. The scolex of T. saginata looks similar but lacks hooks. 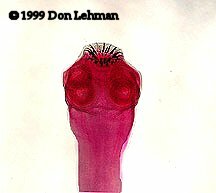 These two species can be differentiated by counting the number of uterine branches in the proglottids; T. solium has between 7 to 13 per side, while T. saginata has 15 to 20.